This week on The Bugcast: Dave and Caroline both have numb bums, Twitter extend tweet lengths, and we play 8 amazing tracks of Creative Commons music from The Spin Wires, Seth Power, Professor Kliq, Tomorrow Sounds, The Glass Child, Gabales, Brain Purist, and Papcy TheDon. This week on The Bugcast: we look at new starts from two different perspectives, and we play our usual selection of 8 amazing tracks of Creative Commons music from The Gasoline Brothers, The Osages, Plants, The Glass Child, BETP5, Ocean Shiver, ISRA, and RogerThat. 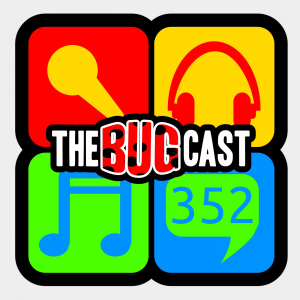 This week on The Bugcast: lots of news from the world of entertainment, and our amazing selection of 8 amazing tracks of Creative Commons and Independent music from texasradiofish, The Thin Cherries, The Rabbitts, The Glass Child, Wordsmith, Mickey Blue, Twin Flames, and Ed Napoli. This week on The Bugcast: Caroline gives her selection of favourite tracks from the past year, from Mercury & The Architects, Lost and Profound, The Borgious, Christian Kane, Deep Down Inside, The Fortunville, The Glass Child, Sterling Fox, Mirva, Tarra Layne, Arrow & Olive, Roy Smiles, Sugarlab, Bella Ruse, Jill Zimmerman, and David Amber (feat. Devyn Rose). This week on The Bugcast: pain, birthday, Eurovision, and our usual mix of 8 great tracks of Creative Commons music from Maze, Bellevue, Kinematic, Jasmine Jordan, Devon Elizabeth, Boogie Belgique, The Glass Child, and Manhat10. This week on The Bugcast: in the last of our episode 350/seven year celebratory shows, we feature Dave’s selection of the best tracks from the past year. Tracks played from Million Sins, Mirva, Lewis Hurrell, Beautiful Mess, In Isolation, The Glass Child, Boogie Belgique, Hillary Reynolds Band, Brückenbauer, Live Hart, madelyniris, Anna Neale, Kicklighter, Publisher, ProleteR, and A Is For Atom.